Instead of £41.00. You save £2.05 due to the online discount . The impact protection for MULTIPAL® racks is particularly recommended for warehouse operations with forklift trucks. It is tailored to fit the posts of your racking. Installation is a breeze thanks to the screw anchors supplied. 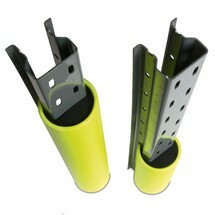 Protect rack posts at entrances and passageways for forklift trucks with these impact protection corners. They are tailored to fit MULTIPAL® racks, but are also suitable for other racking types. 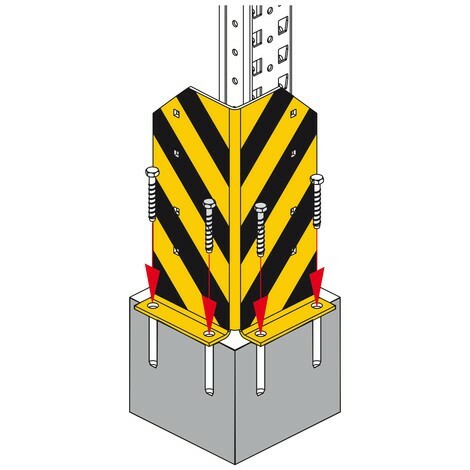 An ideal solution for protecting racks against impact and collisions. Your goods remain secure throughout all warehouse activities. The solid steel angle construction in the warning colours yellow and black is easily visible from a distance and offers reliable impact protection according to DIN EN 15512. In warehouses and other interior spaces, you can use the screw anchors supplied to easily secure the impact protection to the ground in front of the posts of your MULTIPAL® rack. Safeguard your warehouse operation by ordering the impact protection for your racks from our shop.